And if our decorations were edible this year? Instead of installing plastic characters or fragile items for the holidays, why don't you choose edible stuff, but so pretty? Your guests will be delighted and as everyone could eat these decorations, we will avoid the overconsumption of non-ecological materials! What do you think? Do you want to try? Here are 13 great ideas to inspire you in your projects! Idea # 1: Edible "terrariums"
It's easy to create these beautiful terrariums! Fill jars with chocolate cake crumbs instead of potting soil, grated coconut instead of snow and chopped hazelnuts instead of gravel. Add animal-shaped cookies, gingerbread figurines ... and try not to eat them before the guests arrive! A simple idea, but great! 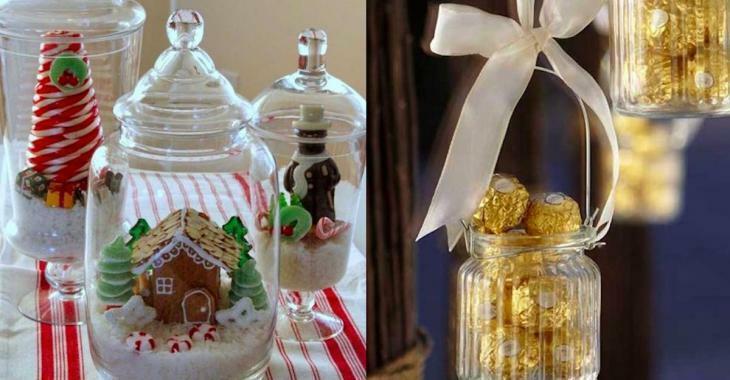 Grab glass candy boxes, biscuits and various candies and create a tiny Christmas village in jars! 3. Idea # 3: Christmas ornaments made of candies! These delicious decorations will delight adults and children. By opting for the Ferrero, you will have golden paper and it's perfect for the Christmas party. But you can choose any other treat. Take transparent balls in which you will drop macaroons of different colors. Are you hungry ? Just open a ball and enjoy the contents ! Houses made of gingerbread will be beautiful on your Christmas table! The stained glass biscuits let the light go through for a magical effect. Make a hole in the shortbread to insert a twine to hang it on the Christmas tree. Beautiful for the eyes and tasty for the taste buds, this savory Christmas tree will give a break to your stomach filled with meat pies and cakes! After the Christmas tree full of vitamins, here is the macaroons Christmas tree! It's Christmas! The small gingerbread cookies are delicious. Juste make a small hole to insert a twine in order to hang these little cookies in the branches of the Christmas tree. It is a Christmas ball containing the necessary ingredients to make a delicious hot chocolate. Santa Claus may pick up one when he will be in your home! A rustic decoration for Christmas. Easy and cheap! On the same principle as the hot chocolate Christmas ball. Use transparent Christmas balls and add cookies inside! After all that sugar, enjoy the cheese! A really simple idea, but smart at the same time!